What about the Friends money? What are our biggest outgoings? How has the plan gone so far? We have been incredibly grateful to Simon Gautrey, whose work on our accounts has given us a clear picture of where we stand financially. The first year of his work saw us get on top of Gift Aid claims, up-to-date with expenses payments, and generally get us on a good administrative footing. The past year has enabled us therefore to see a year played out in our accounts and, for the first time, what we may have suspected before became very clear – we are running year on year at a deficit that is not sustainable. While the building restoration fund is healthy, thanks to the fundraising of the Friends of Caldecote Church, led by Roger Sylvester-Bradley, this is ring-fenced for one-off improvements and repairs. As a parish church we receive no funding from the national church or from the government, and so all our daily expenses – including our share of the costs of having a vicar – have to be met by financial gifts. It is now clear that our service collections and standing order donations are no longer enough to cover these costs. Without a vicar we can’t be there for those life moments in the parish, whether they be weddings, christenings, funerals or simply offering a place for weekly worship and seasonal gatherings at Christmas and Easter. And so – we have a plan! In order to be sustainable, our treasurer’s estimate is that we need to increase our income on the daily running account by £7000 a year (c.£600 a month). However, we do not have the tagline ‘the little church with a big vision’ for nothing! At our annual meeting, I put forward a plan, which I’d like to share with you here today. Our strategy is to break this down into smaller chunks, so that we can set realistic targets using a number of potential sources of funds. When you do that, as you’ll see, the vision of being a sustainable church for our local parish can very feasibly become a reality. Before we delve into the plan, I’ve thought of 3 questions you might have, so we’ll answer them for you! The Friends of Caldecote Church was established to meet a need for money to fund urgent repairs to the church and to fund projects to improve the church building and grounds to make it a more welcoming place. The biggest two projects so far have been the replastering work and the window restoration. Anyone who’s been in the church recently will have seen (and felt – it’s warmer without holes in the windows!) the difference this has made. Although there is still a good balance in the Friends’ bank account, all money raised by the Friends is ring-fenced and cannot legally be used to fund daily expenses. It is therefore the daily running account that the plan that I’ve set out below addresses. The biggest outgoing is what’s called the ‘Ministry Share’. As a member of the Church of England, Caldecote Church fortunately does not have to deal directly with the salary, National Insurance contributions, pension and housing for our vicar – these, together with a wide range of other administrative and legal functions, are undertaken on our behalf by our local Diocesan office at Ely. 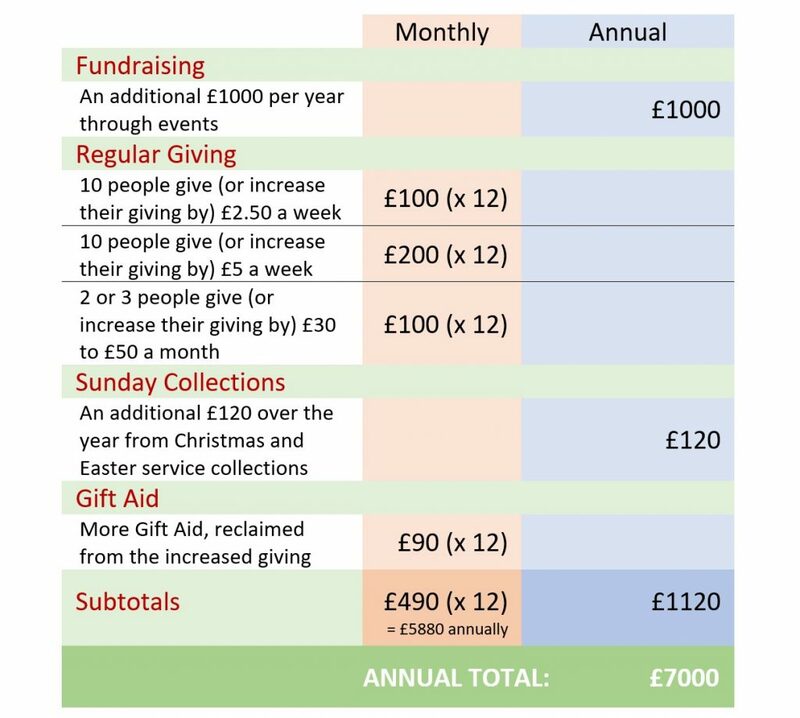 ‘Ministry Share’ is a contribution towards these costs, and is based partly on the size of the congregation, so smaller churches like ours are in effect subsidised by bigger ones. The other two big ticket items are also unavoidable if we are to continue to provide a parish church in Caldecote: insurance for our Grade 2* listed building, and the cost of heating the space for services. Every penny of our income is from a donation (or a grant) – like all parish churches, we receive no funding from the central church or from the government. Our income is made up of offerings in the collection plate on Sundays, regular giving by standing order or direct debits and fundraising events. Additionally in recent years we have received a £500 grant from the Parish Council to help towards the costs of maintaining the hedges, grass and public footpaths in the churchyard. I’ve broken down the target of £7,000 into small achievable chunks, none of which are over-ambitious. We are a small church made up of busy people with limited resources of time and money, and the key to a successful plan is that it can be sustained for many years to come. The plan has in fact already started, and we’ve already increased our annual income in the running account by £2800. That’s before most people even knew about this financial plan, so as you can see, the target of £7000 really is achievable – we now need to increase our annual income by £4,200. Largely through a new approach to publicising our events, we have over the past year raised the additional £1000 required (this isn’t counting the money raised by Caldecote Open Gardens, which went into the building restoration account). Over the past year, we’ve achieved the target of a £120 increase in the collection plate at Christmas and Easter services. The additional income from regular giving and Sunday Collections has raised an extra £30 per month (£360 annually) in Gift Aid income. If you can join us in making a regular gift – however small – as you can see from the table, it won’t actually take many of us to make a difference and put this little church on a good footing for the future. Set up a direct debit from your bank account. Click here to email us your name and mailing address and we’ll send you a Parish Giving Scheme direct debit form. Do fees eat away the donation? What about standing orders and the envelope scheme? Direct Debit is easier for you to control and easier for us to manage than standing orders or cash in the collection plate, so if you are reviewing the amount you give, do consider making the switch to direct debit at the same time. If you currently give by standing order and would like to switch, simply cancel your standing order and set up the direct debit to start the following month. You can choose exactly when the first payment should be taken. If you currently give in the collection plate (either loose in the plate or using the Gift Aid envelope scheme), once you’ve set up the direct debit, instead putting money into the plate, put one of the Parish Giving Scheme tokens. You’ll find them on the table next to the hymn books – just pick one up on your way in. It’s a simple way to dedicate your gift to God each Sunday. Caldecote Church is a special place serving the local community in a quiet but committed way, offering a place to worship, a caring congregation and a place for the key moments in the lives of the people who live in the parish, from special seasonal services to christenings and weddings. If you decide to set up a monthly direct debit – however small – thank you for helping to make Caldecote Church sustainable so that we can continue to serve and minister to the parish of Caldecote and Childerley.